Retirement Archives • WORK. REST. PRAY. Well, that was 20 years ago. Today, I got to retirement. That was it. And that was good. So good. For most of the intervening 20 years, I’ve worked with the most wonderful team of colleagues. Caring, supportive and one with a common purpose. A team with a default answer of ‘yes’ – or at least, ‘let’s think about it’. Rather than the demoralising ‘No, we can’t do that’ attitude common in so many workforces. It’s a team which values each other for who they are, not just what they do. I know I have been very fortunate. It has been a privilege and an honour. For many people, the only reason they know they’re doing a good job are the times when they’re not being criticised. Not that I’ve never been criticised. Far from it. I’ve upset people. I’ve trampled over some. I’ve poached staff from others. I’ve worked with difficult people. I’ve made mistakes. I’ve been bullied, shouted at and disrespected. Everything that happens to everybody at some point or other. That’s working life. 41 years of it. Yet many people are never thanked for the work they do or honoured for who they are. For me, though, these last few months have been humbling – and somewhat overwhelming. Nominated for a NHS 70th Anniversary Parliamentary Award (which I didn’t get) and a Lifetime Achievement Award from my employer (which I did). And then there was: ‘Urgent – On Her Majesty’s Service’. A letter from the Palace. Six weeks of silence. Nobody could know. When they did, the congratulations were overwhelming. 153 emails. 21 cards. A real honour and deeply humbling. All too much, though. I’ve only been doing my job. Buckingham Palace last Friday and farewell lunch today. And it all happened again. Cards, congratulations and compliments. Both amazing days. Quite surreal at times. Asked by Prince William if I (me!) thought he (him!) was making progress in supporting employers regarding mental health. The farewell lunch gathered together over 50 people who have supported and taught me so much over the years. Another honour and privilege. A generous farewell gift pays for a specially commissioned icon to be written (the technical term for icon painting) by Brother Michael OSB, Benedictine monk at Mucknell Abbey. It will be based on the famous 15th century icon by Andrei Rublev. The Trinity. 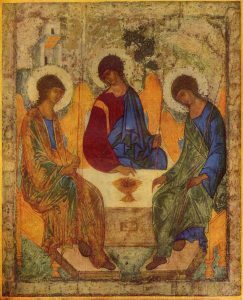 The icon depicts, from left to right, God the Father, God the Son and God the Holy Spirit. The embodiment of Love. Seated around a table. At the front, an empty place. A place of honour and privilege – and not just for the honoured and privileged. A place at which anyone can sit. Working or retired. Happy at work or not. Employed or unemployed. Parent at home, student or volunteer. Well or unwell. Feeling loved or unloved. Of faith or no faith. Whatever your situation. The place awaits you. A place of honour and privilege. A place to which you are invited. Invited by Love to be honoured for who you are. Thank you for reading this post. Please subscribe, share and like. If I’d had £5 every time someone asked what I’ll be doing in retirement, I could have bought myself my own gold watch. Play on repeat: ‘Writing books and blogs, learning the piano, photography, family history, U3A, joint ministry with my wife…’ But how upset I’d be if nobody asked. I am so grateful for and humbled by the interest and love shown in these last few months. Preparing for the next stage of life – as I prefer to call it – started five years ago. You only get one go at this, I thought, and I want to make it work. Having spent 30 years helping people with phased returns to work, I’ve taken a staged approach towards retirement. Five to four days a week three years ago. Three days since January. Changing the balance of life. Getting used to less structure. Less contact with people. Building new routines. It’s worked. This writer approaches the next stage of life with a sense of calm. And for one for whom it is an elusive emotion, there’s even some excitement. At work itself, the last three years have seen succession planning (a far too grand a title, really). We’ve crossed a few hurdles on the way. Many have helped in the process. That’s worked too. Achieving what we wanted. In full and on time. Recruiting replacements. Handing over to successors. Spending less time with immediate colleagues: enabling them to work together, develop and flourish. It’s going to be even better. Wow. In all this, I’ve not been counting down the days. So this week’s realisation that there’s just six working ones to go came as a shock. The calmness shaken. The boat rocky. A strange time. The nearer it gets, the less believable it becomes. Such is the nature of change. But it’s a time to give thanks for the privileges God has given. The privilege of making a difference. The privilege of playing a part in the lives of others. Seeing people make progress – especially in the small ways. Never ignore the small ways: they are always bigger than we think. The privilege of the next stage of life and all that will hold. I’m writing this on retreat at Alton Abbey, a community of Benedictine monks in Hampshire. There’s a storm blowing outside. There’s one blowing inside too. But this is a place where the clock runs slowly. Where the silence of mealtimes is comforting. The routine of prayer is steadfast. The presence of God is everywhere. There’s sanctuary in the stillness. A place of stability in the stopping and the starting. ‘To you, O Lord, I lift up my soul. Oh my God, in you I trust.’ (Psalm 25). Play on repeat. It works.